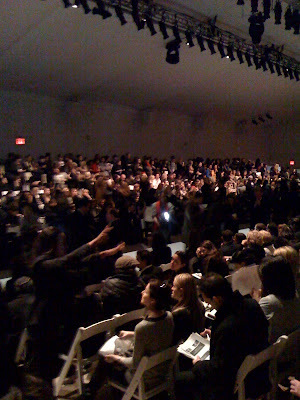 New York Fashion Week: Carlos Miele Fall 2010 | Fashion. Style. Beauty. | Life is short. Live well. The Scene: The atmosphere pre-Miele this morning was upbeat, with snappy jazz tunes playing throughout The Promenade as the usual suspects sauntered to their seats and PR girls scurried around desperately to fill the empty ones. Overheard In The Crowd: Perhaps the most brilliant comment of the morning came from the AmEx Twitter board while the previous show was letting out. It read, “When I am a wealthy woman of a certain age I shall only wear Carolina Herrera.” signed, David. The Collection: The show started off with a feisty, form-fitting color-blocked mini accessorized with gold and black peep-toe booties. More bold colors followed, but not consistently. Darker tones and more conservative separates were interspersed throughout the show, making it seem disjointed. While I do love me a well-made harem paired with cropped fur, seeing it walk down the runway behind explosions of fuchsia and electric blue was somewhat confusing. Overall Impression: I was excited for a vibrant, fun collection, and although there were high points, I felt like I was on a manic roller coaster ride going from happy to moody and back around again.